Senior Jill Costello, second from left, a member of the Cal women's crew team, was diagnosed with stage IV lung cancer in June. Jog for Jill, a campus charity run, took place Sunday to raise awareness and funds for cancer research. Two speakers give thanks for those who participated in a running event for lung cancer. Hundreds of people participated in a campus charity event Sunday, inspired by UC Berkeley Senior Jill Costello, a member of the women's crew team who was diagnosed with stage IV lung cancer last year. Jog for Jill was organized by Costello's campus chapter of the Kappa Kappa Gamma sorority and raised more than $37,000 for the Bonnie J. Addario Lung Cancer Foundation. Many in attendance said the event served a dual purpose. "Definitely it reminds me of all the people that are standing behind me ... physically and emotionally," Costello said. "And it's cool to see people come out for a cause that is not only under the radar and stigmatized ... people aren't even aware of the effects on the age group like mine." Sheila Von Driska, executive director of the foundation, said the organization has raised about $4 million in the past four years for lung cancer research. Costello, a member of the women's crew team majoring in political economy, said she was first diagnosed with stage IV cancer following her return from the NCAA championships last June when she suffered from persistent stomach pains. She said over the next week, she went through a battery of tests including CT scans, X-rays, ultrasounds and further blood tests. "That's when they found the mass in my lung," she said. Costello said she was surprised by the outpouring of donations from the community since her diagnosis and throughout her current struggle with the most advanced stage of lung cancer, which has already spread to other parts of her body. "It's amazing," she said. "I couldn't believe how much people gave." Through a partner organization, the Addario Lung Cancer Medical Institute, the foundation, which was established in 2006, two years after foundation founder Bonnie Addario had undergone treatment for lung cancer herself, has worked with seven medical research universities across the world, including UCSF, USC and the University of Barcelona, to create a virtual specimen depository, she said. This database would collect data on tissue samples from the various institutions and be made available to all lung cancer researchers, Von Driska said. According to Darby Anderson, Costello's friend and fellow sorority member, Anderson suggested to the foundation the idea of holding a fundraising run at UC Berkeley after she and Costello helped bring about 100 people to another foundation charity run in Golden Gate Park last year. 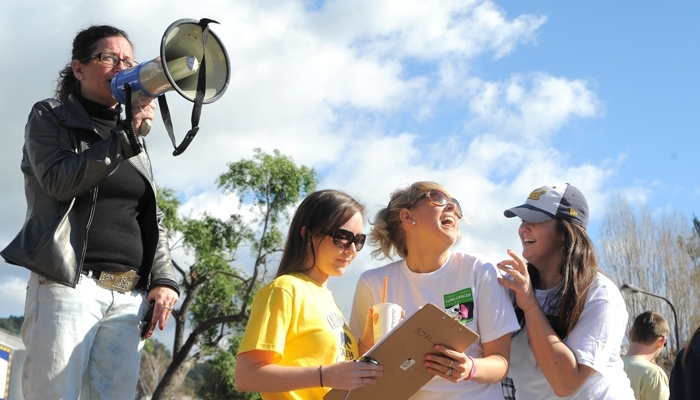 The fundraising run drew supporters through her crew team and sorority connections throughout the Bay Area. Sorority members from the Santa Clara University chapter of Costello's sorority came from San Jose to attend. Also, about a dozen members of the women's crew team from campus rival Stanford University turned out in support of Costello's cause. "We can be rivals on the water but we can be friends off," said Cardinal sophomore and 2008 U.S. Olympic team member Lindsay Meyer.